2. Soak black fungus in hot water for 20 minutes, rinse well, then dice fungus. Soak glass noodles in water for about 10 minutes, cut it into 2cm length. 3. Mix ground pork, fungus, glass noodles, minced shallots, ground pepper and a teaspoon of stock granules. Stuff squids with mixed pork. Pin squids with toothpicks. 4. Heat a frying pan, add 3 tablespoons of vegetable oil. When the oil is boil, add squids and their heads to fry over medium heat. 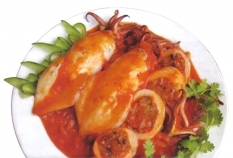 Then, place containing squids on a plate. 5. In another frying pan, brown 2 cloves of garlic with a tablespoon of vegetable oil. Add tomatoes to stir-fry. Season with stock granules, sugar and a little salt. Stir well. Add squids. Cover with a lid and cook over low heat for 10 minutes. Sprinkle with pepper.